If you have never seen the text above don't feel bad. Apparently the Republicans in Florida never did either. Above is the constitutional amendment Floridian voters overwhelmingly approved four years ago during the 2010 midterm elections. 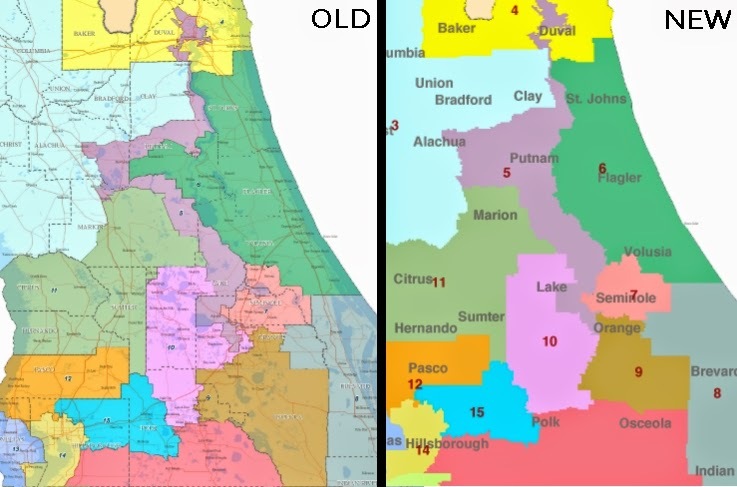 In response to the new constitutional amendment calling for geographically compact and demographically balanced districts, state Republicans, with the aid of lobbyists and political operatives, redrew Florida's congressional districts to maximize Republican votes. They carved out every minority neighborhood and democratic stronghold from Orlando to Jacksonville - a 200 mile "compact" stretch. And don't forget college town Gainesville. All these areas were shoved into one single "safe" Democratic district held by Corrine Brown, effectively making several other "safe" Republican districts. These gerrymandered districts were called out by a federal judge in July as being blatant power grabs by the majority party and ordered them redrawn. So what did Republicans do? While they gave Brown's "safe" district a little more conservative voters and added some minority neighborhoods to Daniel Webster's conservative district, they also took away a huge swath of Osceola, an area that is 47.8 percent Hispanic (25%of the population being Puerto Ricans), from his district, so essentially the only change was making Corrine Brown's district a little less "safe" while maintaining every adjoining Republican district. How are these districts constitutional? Have the best solution around. Do THIS? And not only does gerrymandering become a practical impossibility, but so does buying an election.